Touch down in 4-star comfort at Novotel Tangerang. 45 minutes drive from the International airport and 45 minutes from Jakarta. Panorama windows let natural light into your sleek contemporary room and show off the views. 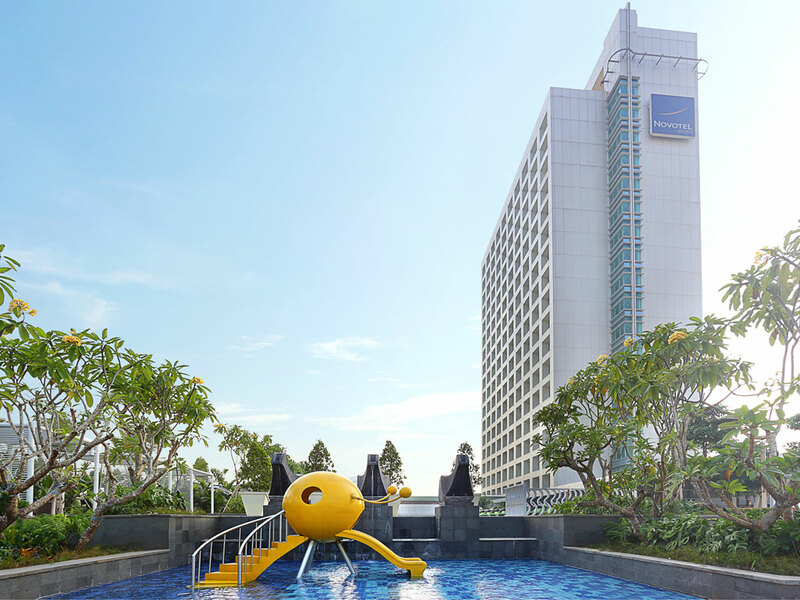 Rise and shine with few laps at the rooftop garden pool. Enjoy the variance of menu in the vibrant and airy restaurant, The Square. A space with video game, specially designed for children and Mac corner for guests are available in the lobby. This hotel offers an ideal base to explore the interesting destination and various tourist attraction. The historical said Tangerang is believed to be the site of one of the first settlements of ethnic-Chinese in the archipelago. Spacious, contemporary in-design, and adaptable, the Novotel room is truly a place for living. Perfect for all your needs. The Lounge Bar is an intimate, friendly bar, which serves a wide range of cocktails, mocktails and other beverages. Light snacks are also available, making it the perfect place to catch up with friends or have informal business meetings. Located at the podium floor, adjacent to the Health Club and Spa, the Pool Bar is a convenient spot to relax while enjoying the smoothies or light bar snacks. Bo mitt i en shoppingmall. + Bra, trevlig personal. Rum var OK, rent, a/c och WIFI fungerade bra. Bra frukost. - Lång resväg mellan flygplats och hotell, omkring 20 km, trots att avstånder fågelvägen är bara 5 km. En del utrustning på gymmet behöver översyn, reparation.